This was our third trip to Westpunt. We enjoy the serenity of this end of the island. West Hill Bungalows sits in the middle of nature on the side of the hill, giving you a wonderful view of all that is Westpunt. It was very quiet and peaceful. The owners Diane & Jon were fantastic and very attentive to anything we needed. We stayed in Bungalow #3. The bungalow was comfortable and clean. We loved the louvered shutters on the windows. When open there was a fantastic breeze. The windows in the bedrooms had screens. Bring with you mosquito repellent or a citronella candle. The pool was right outside our front door. Like having our own private pool. It was very clean and well maintained. Be mindful of leaving food open on the counter as the birds like to come in for a snack when the windows and doors are open. There is a cooktop, refrigerator, coffee & tea pot and toaster. At this pont there is no oven or microwave available. The current owners have only had the property since December. They were busy while we were there painting the units inside and out. They were very interested in our suggestions for improvements. We were the first divers they have had stay there. There wasn't a rinse tank or anyplace sturdy enough to hold our gear to dry. Jon suggested under the tiki huts until he could get something...This was our third trip to Westpunt. We enjoy the serenity of this end of the island. West Hill Bungalows sits in the middle of nature on the side of the hill, giving you a wonderful view of all that is Westpunt. It was very quiet and peaceful. The owners Diane & Jon were fantastic and very attentive to anything we needed. We stayed in Bungalow #3. The bungalow was comfortable and clean. We loved the louvered shutters on the windows. When open there was a fantastic breeze. The windows in the bedrooms had screens. Bring with you mosquito repellent or a citronella candle. The pool was right outside our front door. Like having our own private pool. It was very clean and well maintained. Be mindful of leaving food open on the counter as the birds like to come in for a snack when the windows and doors are open. There is a cooktop, refrigerator, coffee & tea pot and toaster. At this pont there is no oven or microwave available. The current owners have only had the property since December. They were busy while we were there painting the units inside and out. They were very interested in our suggestions for improvements. We were the first divers they have had stay there. There wasn't a rinse tank or anyplace sturdy enough to hold our gear to dry. Jon suggested under the tiki huts until he could get something built. We made a few other minor suggestions that were accepted enthusiastically. Room tip: For the best view of the water unit #1 seems to have the most unobstructed view. Unit 3 is closest to the pool. West Hill Bungalows has been under new ownership since December. The new owners are a Dutch couple who live on site in one of the 9 bungalows. If you stay here, you will see them all the time and they will assist you with anything you need. Once navigating the really rough road up to the property, you will find your small house with a nice deck and a sea view. The pool is very nice and it is clean. It is quiet and peaceful here. The house is a self-catering accomodation. This is not a resort or a hotel. We shopped for groceries and made some meals at the bungalow and ate out at other times. The selection of restaurants in Westpunt is limited but met our needs. There are a number of beaches within a few minutes drive. The bathroom had a sewer-gas odor but leaving the window slats open helped and we did bring a room deodorizer. One very nice thing here is that each bedroom has 2 windows for cross breeze and those windows have screens on them. If it is too warm to sleep with the windows open, the air conditioner in each bedroom is very effective. The rooms are of a good size and have nice wood floors. The owners have 2 small dogs who love everybody and it is nice to play with them. For wildlife, there are a lot of birds and lizards. When judging this place, one has to first realize that this is a bungalow you rent, and cater for your own service. It is not a resort with staff and programmes. We only saw Naomi from the staff at check-in - for the rest we were all alone - which suited us fine! (Oh, there is also a cleaning service every third day). The location is at the outskirts of Westpunt at the north/west tip of the island. Far from Willemstad and the nightlife. As such it is a relaxing retreat for peace and quiet, or suitable as a base for divers taking daytrips to the many divespots along the north/west coastline. The houses are very nice with 2 airconditioned bedrooms with firm beds (a bit too firm to my taste) and firm pillows (! ), a tiled shower/toilet (shower has no temp-setting - it is lukewarm wether you like it or not. I found it comfy and somewhat warm, (whereas my wife would have liked it warmer), a kitchen with a good-size fridge with freezer and a gas-stove (do bring matches! ), all watertaps can be turned for "hot-cold" - but don't be fooled - there is only one pipe connected and temperature is room-temp. But fill the jug with tapwater and put in the fridge - the quality is very good! The terrace is facing straight north wich we first found strange, but later (and more sunburned) appreaciated. 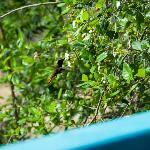 The trees and plants around the houses have lots of birds including parakeets and hummingbirds. Close to the entrance, there is a "servicetable with a phone and a WIFI-router. If you have a house close enough you may reach the wifi, otherwise you can lounge under the roof and connect directly to the modem with a LAN-wire. Internet is free, make sure you get a password at checkin. Note that there are no amenities, but the company offers a "starter pack" at USD 75 with a basic filled fridge, washing up liquid, matches etc. Do remember to bring moscito repellant - you'll need it commonly around the island. There is a small charcoal grill if you like to cook yourself some nite. When we left our flight was late afternoon, so we wanted to stay after regular checkout (11:00), and that was no problem after calling Naiomi. We arrived the week after lots of rain had passed as a result of the hurricane Sandy had passed further north, and the road up to the bungalows was partly washed away. Our small rented KIA skipped and bumped like driving off-road. A 4x4 had been more suitable. This road needs to be updated. The distance from the airport was longer than expected - dont worry if you think you have been driving too far - it is not possible! Just go on, you WILL reach Westpunt eventually. I had checked the internet before on what electrical plugs that was used on Curacao, and learned that it is a odd mix of Euro-plugs and 110 volts with 50Hz (!). But at Westhill Bungalows they have installed US-type wall-sockets. So coming from europe, I had to buy some unexpected adaptors. We had a few night with thunderstorms, and electricity was gone from most of the northern island for a few hours. Then they got all Westpunt ALMOST running on dieselgenerators, and the power was luckily enough to run our aircons that nite, but not the fridge or charge our phones. Regular power was back the next day. On the other hand, it is not right to blame WHB when the whole village is out of power. Some reviewers had a bad pool experience, but when we were there, it was OK, filter running and all clear. Room tip: WIFI is located in one end of the area (south), and the pool in the other. You maybe have preference? We stayed for a week in Oct.I was not surprised by the foul smell in the bathroom as I had read in a previous post about sewer gases.I brought air fresheners with me which was a help.I found out just leaving the bathroom slats opened all the time eliminated the problem.The other issue was an ant problem.Our first night there,my husband and myself woke up to ants in our bed.We had no food in our bed.They were coming from the headboard.We called management and they put moth balls under our bed.We had no more ants in our bed afterwards.The other couple that stayed with us discovered dirty bedding with iguana poop on it.When we called management they responded the next day with clean sheets.We payed 40.00 / couple per day to stay there which is probably what it would cost to camp so we didnt complain.A word of caution about leaving the window slats opened at night, dont.One night we had an invasion of flying ants.They were everywhere.We had to close all windows and doors and we must of killed over 100 in our bungalow.Next time I will probably opt to pay a little more for a place up the road.Never did meet Norman or receive breakfast.Still trying to figure out why Westhill is classified as.a.B&B	? Beste choice for your stay in Curacao! We just came back from a great and sunny vacation in Curacao. We stayed one week in Westpunt at the West Hill Bungalows and one week at the eastern part of the island. Our best week was definitely at West Hill Bungalows, what a great place!! We were greeted by Naomi who welcomed us with a nice bottle of wine (: very nice start! she showed us around gave us information about the area and some great restaurants tips. When we unpacked our baggage we went for a small walk around the area. If you like a natural environment, West Hill will be the perfect choice. We walked almost every day to the nearby beach for a short swim to start off our day. The bungalows were clean, comfortable bedding and such a relaxing atmosphere. The pool area is beautifully surrounded by tropical banana trees and comfortable pool chairs. Thank you so much for this great vacation. We are definitely coming back next year!! I read several reviews on here as well as did the research on this site and found this place to be nothing like what was written about it. While I understand that the tropics have bug issues because the houses are all open, the booklet we read upon arrival stated that pest control was taken care of...wrong. We did not bring any food in the house the first night and the entire kitchen was covered in ants. Then the lack of P-Traps under the shower provided an awful experience and smell when trying to clean up. The sewer gases were terrible! The beautiful clear water on the website of the pool is totally wrong. The pool water was green and there was no way I was stepping in that. 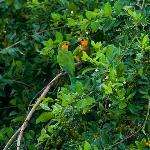 The only thing enjoyable was the beautiful birds that frequented the plants around the bungalow. I would not recommend this nor would I go back. Room tip: If you're from America don't try to use the pay phones if you need the gas turned on as we found out they don't work. Look around for someone and just ask if they work there.